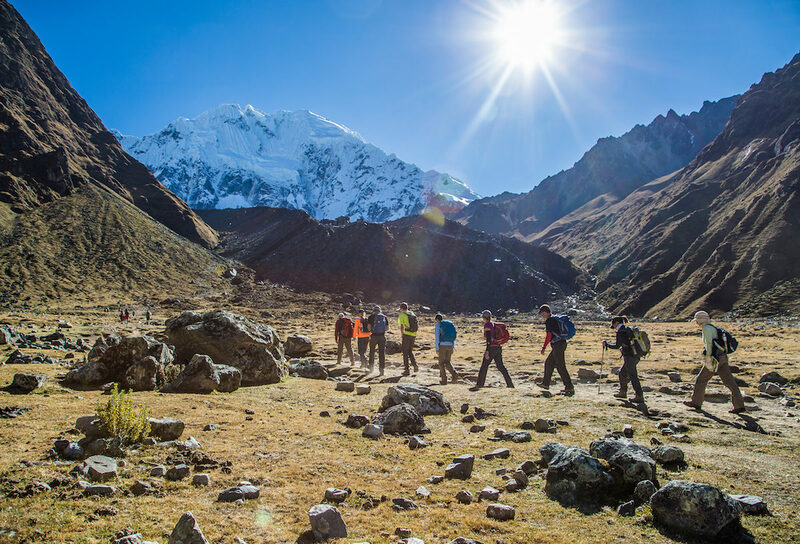 Hike to Machu Picchu far from the madding crowd on the award-winning Salkantay lodge trek. Hike by day, unwind in the lap of luxury at night at a series of exclusive mountain lodges complete with hot showers, goose-down bedding, jacuzzis and fine dining. Four nights in luxury mountain lodges. Six days hiking the legendary Salkantay trek. Dramatic mountain views along deserted trails. Along the way you'll stop at the Inca ruins of Tarawasi and the remote village of Mollepata. Reaching the trailhead at Marcoccasa you'll meet your porters, gear-up and set out along the Camino Real (Royal Path). Before too long the glacial peak of Mt Salkantay swings into view, completely dominating the skyline. Salkantay was among the most sacred Apus (mountain Gods) in Inca mythology, and is the highest in the region (6,270 m/20,600 ft). Reaching Salkantay Lodge you will settle into your private room to recharge before re-convening with your guide for dinner and a briefing of the next day's action. Hiking time: Approximately six hours (including picnic lunch en route). After a hearty breakfast you'll begin a slow ascent up to the plateau behind the lodge. After around two hours hiking you'll reach the stunning turquoise waters of Lake Humantay, fed by the gigantic glacier that looms in the background. Relax, enjoy a snack and mediate in the tranquility of this magical spot. And if you've got energy to spare you might also enjoy a spot of kayaking on the lake itself! Descending back to the lodge in time for a good lunch you can spend the afternoon at your pleasure, soaking in the jacuzzi, indulging in a massage, or simply enjoying a well-deserved nap. Trekking time: Approximately four hours. Day three is the longest and most strenuous day of the trek, but also the most rewarding. After an early start, you'll hike the Rio Blanco valley, circling Humantay Peak. The final and most challenging climb leads to Salkantay Pass, the highest point on the trek (4,636 m/15,213 ft), followed by a dramatic descent through fields of giant boulders, often shrouded in fog. After a very welcome hot lunch, you will continue down through rolling hills and marsh-like plateaus as you reach Wayra Lodge. The most remote of our lodges, Wayra sits on a promontory that offers a spectacular view of the 'other' side of Mt. Humantay, a reminder of how far you have journeyed that day. Trekking time: Six to eight hours (including lunch). Hiking level: Challenging, crossing a 4,638 m (15,213 ft) mountain pass. After a leisurely breakfast at the Wayra Lodge, you'll continue the descent along the banks of the Salkantay River through increasingly verdant scenery. The warm air begins to rise from the edge of the jungle, bringing colourful butterflies and striking orchids. You'll also encounter more locals as the trail takes you past their homes and farms. At lunchtime you will arrive at Colpa Lodge, located on a high promontory at the confluence of three rivers. You are greeted by the staff with a Pachamanca lunch, a traditional Peruvian meal cooked in the earth by hot stones that create a natural underground oven. After lunch, spend the afternoon lounging in the sun or relaxing in the outdoor jacuzzi while you take in the panoramic views of the green mountains that surround you. Trekking time: three to four hours. Today you will hike through the Santa Teresa valley, hopping over small streams fed by waterfalls that descend from the glaciers above. After breaking for a hot picnic lunch by the river, you'll walk for another hour to meet a vehicle for the short drive to the beginning of the “Llactapata Inca Trail” that leads to Lucma Lodge. You'll notice yet another shift in the climate as the hot air and increased humidity signal that you are ever closer to the Amazon Jungle. Trekking time: five to six hours (including lunch). During a three hour climb up an original Inca path, you'll inch ever closer to the rainforest, with green canopies overhead and the constant sound of rushing water indicating that the river is still nearby. Eventually reaching the ruins of Llactapata at the Llactapata Pass (2,736 m/8,974 ft), you'll be delighted by the southeast view of the “back” of Machu Picchu – a sight few other travellers ever see. Your guide will show you the ruins of Llactapata, followed by lunch in a meadow with panoramic views. The final descent toward the roaring Aobamba River takes you through bamboo forests, fruit orchards and coffee plantations, until you end the day’s hike at the Hidroelectrica train station. A one-hour scenic train ride delivers you to your final stop, the town of Aguas Calientes at the base of Machu Picchu. Overnight: Hotel in Aguas Calientes. Trekking time: four to six hours. At dawn, you begin your guided tour of Machu Picchu with a short bus ride up to the ruins themselves. As you enter the “Sanctuary” (as locals refer to it), the morning sun rises over the iconic Sun Gate and washes the structures and terraces with resplendent light. Prepare to be awed by the incredible stonework of the Watchtower, the Temple of the Sun, and the royal Inca residences, among many others. Take a moment to quietly sit and listen to the wind or to meditate and absorb the energy that envelops you. Your imagination will soar as you contemplate the history of Machu Picchu and its mysterious origins. If you've still got some wind in your sails you can hike to Huayna Picchu, the iconic towering mountain often seen in photographs, for dramatic views that stretch from the Urubamba River valley to the edge of the Amazon jungle. 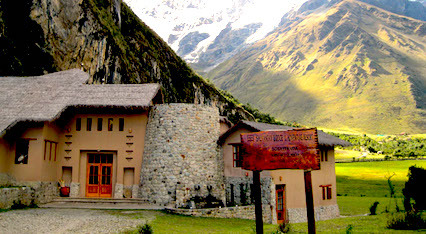 After the visit you'll have lunch in Aguas Calientes before your transfer back to Cusco. As night falls and you arrive at your hotel amidst the bustle of Cusco, you'll sink into your bed at peace and deeply rejuvenated by the near-spiritual experience you've just completed. Enjoy a good night's sleep – you've earned it! We had the most fantastic trip. It was amazing and we are changed in the best ways… slower, clearer and calmer. The rarified air and Salkantay Mountain are now part of our DNA. Thank you for many wonderful pictures, many wonderful new friends and memories of an adventure that will last a lifetime. The lodges were beautiful, well designed and well run, with good food and a most welcoming staff. It was pleasant to be part of a small group in such intimate and spectacular settings. Six nights lodging (five nights in luxurious mountain lodges and one night in Aguas Calientes in a hand-picked 4-star hotel). All meals (hot breakfast, hot lunch, dinner, and water/snacks throughout the day) from lunch on day one to lunch on day seven. Qualified, bilingual trekking guide with deep expertise in the nature, history and topography of the area. Full porter team with mules/horses to transport your pack and personal belongings on the trail. Travel insurance required (not included).